Marcus Maddison smacks home his late equaliser for Posh at Southend. Photo: David Lowndes. Goal hero Marcus Maddison blamed himself for Peterborough United’s failure to take three points from their League One fixture at Southend yesterday (October 1). 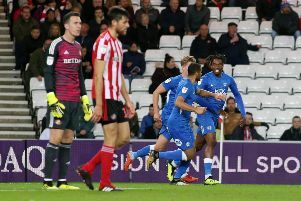 Maddison’s 92nd-minute strike earned Posh a point from a 1-1 draw at Roots Hall meaning the 23 year-old has been involved in eight of his side’s last nine goals. Posh goalkeeper Luke McGee dives on the ball after saving a penalty at Southend. Photo: David Lowndes. But the former Newcastle United Academy player wasn’t satisfied with his day’s work. He also conceded a penalty which was saved by Posh ‘keeper Luke McGee. It’s now five draws and a defeat in the last six games for Posh who have slipped to 13th in League One. Maddison said: “We’ll take an equaliser in injury time, but we deserved all three points based on our first-half performance. “I’m the reason we didn’t win the game I missed a few shooting chances and mny day got worse when I conceded a penalty, but luckily I got a late chance to make amends. “It’s been a frustrating run for us, but at least we’re not getting beaten. We’d have more points if we’d won two and lost four of the last six games and obviously we need to improve our scoring conversion rate. “We had 36 hots in two games recently and scored just two goals which isn’t good enough. It’s also a suprise as myself, Tom Nichols and Gwion Edwards are accomplished finishers. “We’re getting in the positions to score, but somehow not managing it. It’s bad luck as well as a lack of composure. Posh are next in action in the Checkatrade Trophy at home to MK Dons on Tuesday (October 4). They then host third-placed Bury in a League One fixture in front of the Sky TV cameras at the ABAX Stadium on Saturday (October 8, noon kick-off).